The Marvel Cinematic Universe brings the last stop on the long road to Avengers: Infinity War with Ryan Coogler’s Black Panther. There’s no denying that the Marvel Cinematic Universe is an unstoppable juggernaut of films celebrating how interconnected they are and the fact that they are all building towards clear conclusions. With this being the final one before the film that caps off the 10 year journey towards an epic three phase conclusion the expectation is that a lot of the running time would be devoted to setting that up in some way. Remarkably this film is interested in telling its own story and very little else. 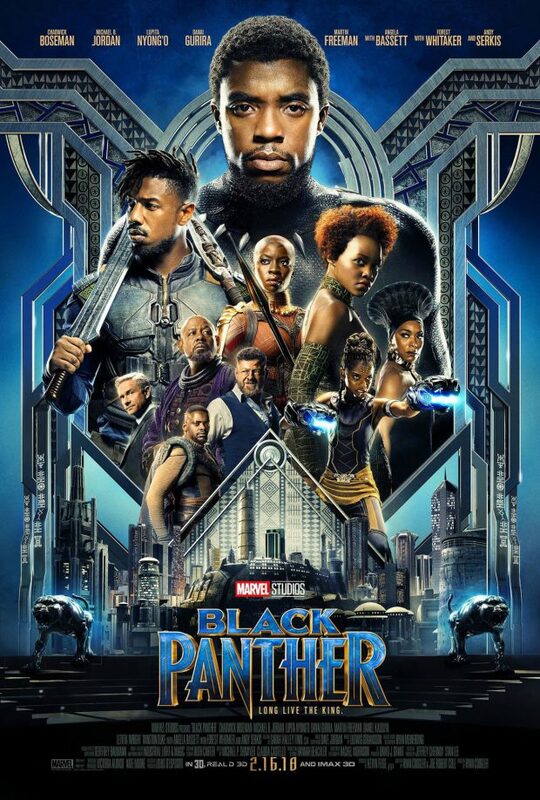 Picking up after the events of Captain America: Civil War -the film that introduced audiences to T’Challa (Chadwick Boseman) and his alter ego, the Black Panther- the African nation of Wakanda is at a transitional point with the death of King T’Chaka (John Kani) meaning that someone else needs to be put in charge. The natural heir to the throne is T’Challa but there are rituals that need to be observed to insure his claim to the throne is genuine. This allows for natural and meaningful exploration of Wakandan culture and traditions. Everything about how Wakandan society featured is intricately detailed and fascinating. The film immediately gives off a sense that the culture is an ancient one with a very strong sense of identity burned into every single one of them. Wakandans are proud of their heritage and willing to defend it at all costs. Chadwick Boseman delivers an engaging performance and plays his role in a very subdued manner. It fits the character as he is a very strong and private person. The character is driven by the duty he has to the Wakandan people and takes that responsibility very seriously. He gives off an air of confidence without it descending into arrogance and is mostly reserved except when he interacts with certain people. Black Panther boasts an excellent supporting cast. Nakia (Lupita Nyong’o) technically takes on the role of a love interest but she is far more than that in the context of the story. She is a character with her own responsibilities, desires and opinions that she isn’t shy about sharing and interacts well with Boseman to create a natural sense of shared history between them. T’Challa’s tech genius sister Shuri (Letitia Wright) is a definite highlight shouldering a lot of the film’s comedy capably and never coming across as anything less than an expert in her field. Her interactions with T’Challa feel both familiar and familial making for a strong relationship that is consistently a joy to watch. Danai Gurira also does an impressive turn as T’Challa’s right hand Okoye, an immensely skilled character who suffers from blind loyalty to the throne for a vast chunk of the film. Martin Freeman’s Everett K. Ross returns after his introduction in Captain America: Civil War and fits into the cast well enough. His appearance feels natural as part of the plot rather than awkwardly shoehorning in a reminder that this film doesn’t exist in a vacuum. There’s a strong sense of a friendship forming between Ross and T’Challa that makes up part of the film’s rich background. Andy Serkis’ s returns after his introduction in Avengers: Age of Ultron and provides plenty of entertainment in his relatively short appearance. Broadly speaking this is a film about T’Challa proving himself worthy of the throne and the respect of his people. To do this he has to prove himself more capable than his chief rival, Erik Killmonger (Michael B. Jordan) who has a complicated backstory tying him to T’Challa on a very personal level. Their antagonistic relationship is well developed and Killmonger’s motivations make sense when considering the background given to the audience. Michael B. Jordan is great in the role adding so much intensity to his performance and coming across as a very dangerous man both physically and in terms of his convictions. He’s a notable contrast to T’Challa’s more reserved and considered nature. The simple core narrative is nicely executed because it feels relatively small scale in terms of the personal stakes. In essence conflict is between two men who have different views on how Wakanda as a nation should be ruled and what their place in the world is. The core narrative allows for deeper exploration of what those values mean and offers points of debate between what one side thinks vs. the other. Interesting questions are posed about the problems of globalisation in contrast to the relative safety of remaining isolationist. Wakanda is an insular nation that is getting closer to a point where they will be forced to interact with the rest of the world and that clearly scares many of them on a very primal level as they fear losing their way of life by opening their borders. This opens the conversation up to issues of immigration, how foreign aid might be interpreted by other nations and general social anxiety about the loss of identity by becoming multicultural. These are all very modern questions and to have them addressed in a tentpole superhero movie is fascinating on its own. Visually the film is incredibly striking. Wakanda is a visual marvel with a real sense of size and scope to it. Not much of it is shown in detail but the impression is that there are various strong communities that exist within the nation with potential for exploration in future visits to this fascinating location. There’s some ropey CGI here and there as you might expect from a film of this scale but on the whole the visual effects people created an excellent visual landscape to make this new corner of the Marvel Cinematic Universe feel distinct. Surprisingly there aren’t as many action sequences as you might expect but the ones presented are distinct from one another, creative in their own right and really impressive. The film relies on a lot of stunt work and hand to hand combat with a good mix between the advanced Wakandan technology and old fashioned stunt work. It’s really impressive and each of them feel meaningful with a clear goal and a coherent style. There are some small areas where the film could be improved. Some of the dialogue is a little bit clumsy making for some really obvious foreshadowing and upon reaching the climactic battle it feels like there’s a chunk of story missing between setting up the need to have it and the sequence taking place. It’s a very small thing but noticeably jarring nonetheless.